Filed to: High Def or Low?Filed to: High Def or Low? DVR is one of the only functions you can't yet find on an iPod, and that's probably because it's still pretty complicated, and getting weirder all the time. 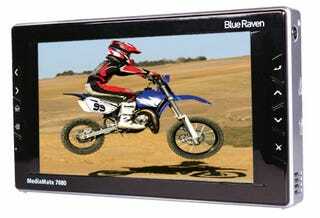 The press release on a new pocket DVR from Blue Raven boasts a 7-inch "high def" screen. But when I looked at the specs on the website, it showed that the screen was only 480x234, as in low-def but fine for a 7-incher. Farther down, I noticed that it can record 720x480 (NTSC) and can scale up to 1080i, presumably for outputting to an HDTV set. This just goes to show that while all of these little HDD PMPs seem similar, there are plenty of nuances that set each one apart. A shame, though, that it's not easier to follow. Other features include a 3-in-1 card reader (SD, MMC, or Memory Stick), a wireless remote control and a "Scheduler" feature that I sincerely hope is easier to program than a VCR. The 40GB MediaMate 7040 costs $379 and the 80GB MediaMate 7080 is $429.